Lawn edging is a simple process that enables you to define a crisp edge between areas of a garden by separating turf with a decorative edging. You could hire a landscaper to do this for you, however in this guide we will discuss step by step how you can achieve the perfect lawn edge with basic gardening tools. There are several different methods you can use to ensure your lawn edge stays crisp, one of the most popular is a metallic lawn edge that is simply pushed into the ground and can be easily bent by hand and joined together to help get your perfect edge. The other common kinds of lawn edging include wooden & plastic. 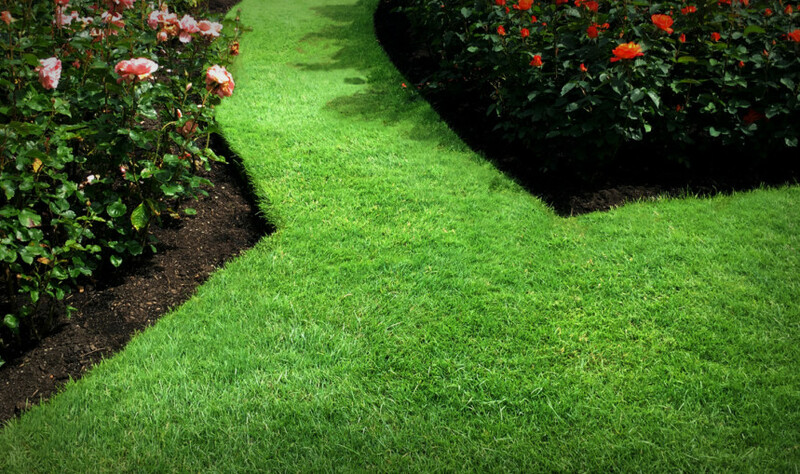 Both options can be inexpensive depending on the size of the lawn you wish to border and straightforward to install. The key to the perfect edge is in the preparation. First, mark out the shape of the edge you want to achieve with a string tied around your spikes in the ground. You will find that this will make it much easier to find a neat edge. If you are using edging strips such as wooden/ metallic strips, simply install them by pushing into the ground along the new lawn edge. Metallic edging strips are often malleable and can be bent by hand to the angle and curve that you need. Here at Online Turf, we supply high quality garden turf across the country with guaranteed next day delivery, so you can get your perfect lawn. We currently provide 3 different types of turf as well as high quality top soil & compost. Not sure how much to buy? Use our handy turf buying calculator to make sure that you buy the perfect amount for your garden.